1. Score salmon skin and season with sea salt. 2. Marinade salmon for 4 hours. 3. Remove salmon from the marinade and pat dry, discard marinade. 4. In a sauté pan over medium high heat add small amount of oil. 5. Add salmon skin side down and sear until crispy. 6. Turn salmon and cook to rare-medium rare. 7. In the mixing bowl with potatoes, onions and tomatoes, season with a pinch of salt and pepper. 8. Add 1 tbsp. of salad dressing and toss lightly. 1. In a small mixing bowl, add marinade ingredients and mix until combined. 2. Add salmon and let marinade for 4 hours. 1. In a large sauce pan, boil salted water. 2. Add 6 (3/8 inch) potato pieces and cipollini onions and blanch in salted water. 3. Cook until tender. Cool and set aside. 4. Cut onions in half. 6. In a medium mixing bowl, place potatoes, onions and tomatoes and set aside. 1. In a small mixing bowl with a cover or a large zip close bag, add all ingredients, cover and shake until blended but not emulsified. On a 12 inch plate or a shallow rimmed bowl, arrange small amount of potato, onion and tomato mixture and scatter remainder around plate or bowl. 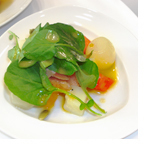 Place cooked salmon on top of potato, onion and tomato mixture and top with pea tendril and borrage cress. Spoon dressing on top salmon and around the plate or bowl.